Have you just built a mining rig featuring four high end graphics cards or are you currently configuring a system incorporating dual AMD R9 295X2 graphics cards? Regular KitGuru readers will have seen our recent review of the Overclockers UK Infinity Vesuvius system – which could demand almost 1,200 watts at the socket. If you are building a similar system, then a 1,500 Watt power supply would be a wise investment. Corsair say that the AX1500i Digital ATX power supply can deliver up to 125 Amps on the +12V rail with an ambient temperature of 50c. The Corsair AX1500i Digital ATX is the only power supply that KitGuru has tested which has achieved 80 Plus Titanium Certification. To achieve such a high certification, the power supply has to operate with a minimum of 90% efficiency between 10% and 100% load, and with 94%+ efficiency at 50% load. 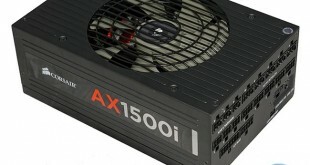 The AX1500i incorporates second generation digital architecture so it can deliver up to 1500 watts of power. This should enable the power supply to produce very tightly controlled voltage regulation over the full range of loads. 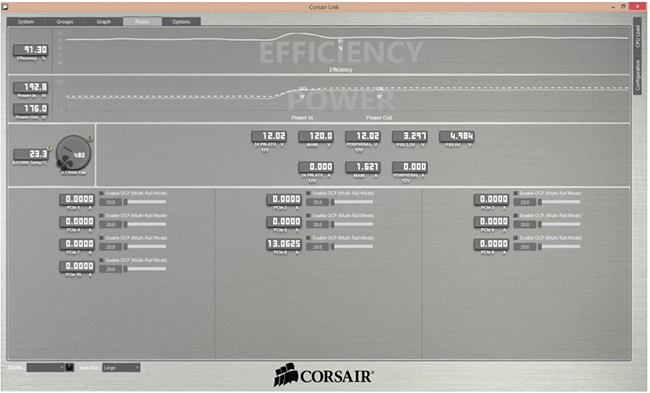 The Corsair AX1500i features Corsair Link support – enabling the customer to real time monitor efficiency and power usage. The user can also control protection and fan speed profiles direct from the desktop. 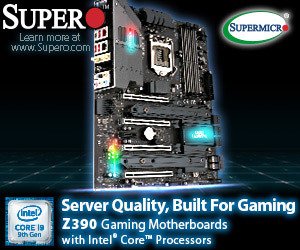 You simply connect the power supply to a USB header on the motherboard to avail of the additional options. Corsair are also trying to ensure that noise pollution is kept to an absolute minimum. The power supply will not spin the fan at low to moderate loads. We will test this later, but Corsair claim loads up to 30% should not force the fan to spin at all. A quick check in my head measures this at around 450 watts – which if correct, is certainly impressive. State-of-the-art DSP-based power control technology providing outstanding DC voltage regulation, reliability and stability. Full DSP-control results in energy-efficiency over 94%, resulting in lower energy bills, and less heat and noise. 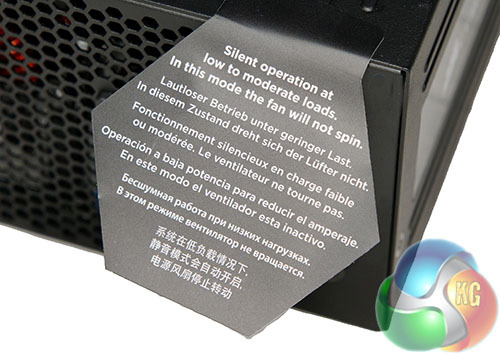 Thanks to its high efficiency and low heat output the AX1500i is able to operate in a silent, Zero-RPM Fan Mode up to 30% of the rated wattage (450W), allowing for the possibility of silent gaming. The fan speed ramps slowly above 30% load, so even fully-loaded PCs can be powered quietly. 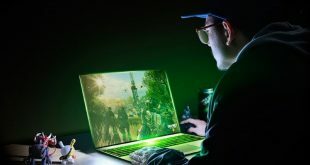 Low ripple and noise equals high-quality power, allowing your performance-critical components, such as high-end graphics cards, to operate reliably for longer. 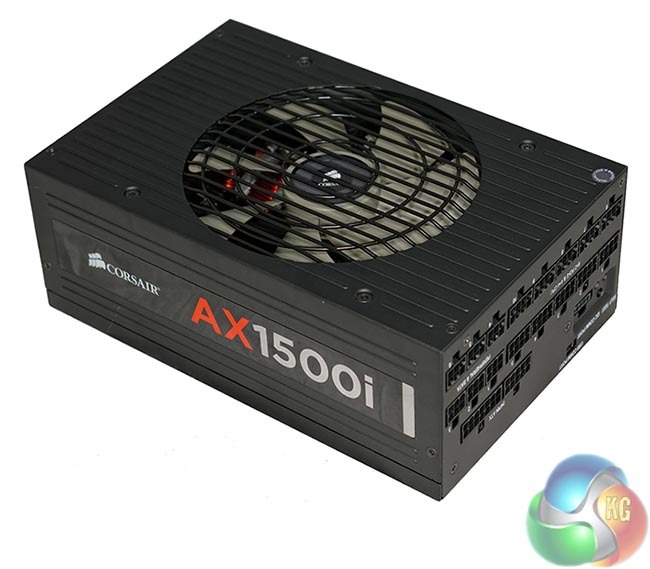 The AX1500i features a massive 125 Amp +12V rail, making it the idea PSU for ultra-high end SLI and Crossfire gaming PCs based around multi-core CPUs. Thanks to the DSP-based design, the AX1500i can be accessed using the Corsair Link interface. This server-inspired diagnostic tool can record and monitor real-time efficiency, power usage, and adjust fan profiles. Uniquely, the AX1500i can also be configured as a multi-rail device with individual PCIe over-current protection (OCP) trip points. The self test switch on the PSU confirms that all the DC output voltage rails are functioning correctly, and the fan is functional, providing a simple method of checking that the power supply is functioning correctly. The fully modular cable system provides total flexibility when building or upgrading your PC, since you use only the cables that you need. This reduced cable clutter also improves case airflow and cooling, and makes it much easier to build your high-end system and route cables. As with all AX PSUs, the AX1500i is built with premium components, such as high-temperature, 105°C Japanese capacitors, and is capable of continuous power delivery at a temperature rating of 50°C, ensuring maximum performance and reliability even in the most hot-running performance PCs. The AX1500i features a comprehensive array of protection and safety features. This includes Over-Voltage Protection (OVP), and Over-Current Protection (OCP) on the 12V, 5V, and 3.3V rails, Over-Temperature Protection (OTP), and Short-Circuit Protection (SCP). Corsair AXi Series PSUs are backed by a reassuring 7-year warranty and comprehensive customer support via telephone, email, forum and the Tech Support Express helpdesk.